And here it is! 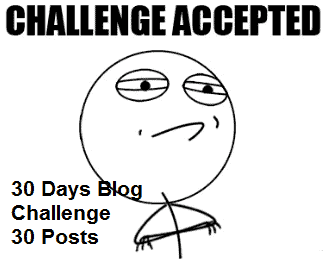 My first 30 Days Blog Challenge. In order to achieve some results sometimes we (bloggers) need to make publish some of our plans. This somehow works as a commitment and also works as a guide to know our path and the results we desire. Stream SEO is 95% ready (design and code), so we could say it’s functional and while it might have some minor changes here and there, the basic functionality is up now. This means I can really start writing, promoting and posting articles, reviews, results and more, but since I want it to grow steadily, I want to make a promise to you guys, my beloved readers. Hosting & Domains: Here I talk anything related to Domain Names and Hosting Services or guides to install and register your blog. You can’t really achieve something if you don’t set a proper target first. My target is to write 30 posts in 30 days, which means I need to spend at least 60 minutes per day in order to achieve it. Now that I know this, I can even settle some mini-targets, which in this occasion is quite simple: I need to reach 7 new posts per week, and for that, I need to write at least 1 post per day, even it’s not strictly necessary. Post each article in my Twitter and Facebook accounts daily and promote it at least twice. Create and achieve at least 20 persons to subscribe to my e-mail list and RSS Feed. Increase my Facebook Fanpage followers and Twitter followers (at least 50 on each). Get a Guest Post accepted on one of my favorite blogs. Comment and Feedback my readers as well as comment on other blogs related to my niche. Improve my Alexa Ranking and Backlinks. By doing all this, I will successfully start my blog and keep it going for the following months. Nuff said, I’ve already settled down all this and prepared some documents and a Framework to work with (which I’ll be sharing with you guys on my following articles). There’s no need to say that I already took care of every aspect related to my host, domain and web design, so I will be able to focus directly on writing articles and studying at least 20 minutes per day. If you’re starting a blog and want to participate, I’d love some competition. I don’t expect to win or bash anyone, and I can think on many positive things going around this. For example, if you’re really interested on joining, you might be able to get some excitement and commitment from my challenge. Also, you’ll know some bloggers and hopefully we’ll all learn from each other. So, if you really want to participate, just comment below and let me know your blog’s URL. Additionally, I will mention you on my reports and will try to give positive feedback if possible. As you can see, it’s a win-win, and there’s really nothing to loose. It doesn’t matter if you’re just building your blog, or if you already started with 5-10 posts. Heck, you can also participate even if you have your blog hosted at Blogger or if you’re writing at Hubpages, Squido, Infobarrel or anything like that (totally free). Just let me know which is your position and I’ll make sure to separate them in different categories. If you think you’re ready to take the challenge but want someone else to know, please share this article. The more people, the better it might result. Or even if you’re not able to participate but know of anyone who fits in, please let him/her know and share the post! We will all appreciate it. Hello Lintang. Can you share a little bit more about your blog? If you’re doing your own challenge let me know the results and I will post them here. Servando, your challenge is inspiring for me, i wanna join! I also will make a report of my job performance, and it would be nice to compare our results. Thank you! It’s nice to hear that from you. Hopefully we will learn all together. BTW, is plugin-design.com the one you’re going to use for this challenge? Can you tell us a little bit more about it?